Back in the 1900s, Alexander was on the rise. So were Alexandra, Alexis, Alexa, Lexi, and lots of other forms of the classic name. Lexus, part-luxury car, part-Alexander name peaked at #449 in 1996. Today, we’re watching the same phenomenon happen with another name: Charles. Say good-bye to the Age of Alex, and welcome to the Age of the Charlies. Charles – Charles currently ranks #51 for boys. 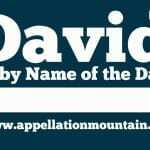 It’s an enduring name, worn by kings and saints, and plenty of men of accomplishment, in fields from literature (Dickens) to science (Darwin). Charlotte – Charlotte is huge for girls, a name I think could hit #1 in the US. It currently stands at #10, and that’s pre-princess. Parents sometimes shy away from names that get lots of press, but I think Charlotte will be more like Sophia or Emma. It’s such a classic, with literary associations (like Charlotte Bronte), that it’s tough to see it as trendy or fleeting. Plus, Charlotte satisfies parents after a nickname-proof name, as well as those who love nicknames. How sweet is Lottie? Caroline – Caroline is currently #58. Like Katharine, it’s a name I think of as effortlessly elegant. Credit to Caroline Kennedy, maybe? Spelling Carolyn also continues to see some use, but it’s not quite as classic as the -ine spelling. Carl – Carl and Karl are the go-tos in many European languages. In the US, Carl feels less sophisticated than Charles, but I think it still counts as a classic name with plenty of notable namesakes, from psychology’s Carl Jung to Olympic athlete Carl Lewis. Charlie for boys – Naming your son Charlie – just Charlie – takes the classic name in a jazzy direction. Think Charlie Parker. It’s also sweetly storybook, from Roald Dahl’s Charlie Bucket to the enduring comic strip character Charlie Brown. And Charlie Chaplin makes the name smile. But Charlie took on a more serious, urgent tone following the attack on French satirical newspaper Charlie Hebdo in Paris. Je suis Charlie became a rallying cry for supporters of free speech and press in the aftermath. Charlie ranked #225 for boys in 2014. Charlie for girls – Like Billie or Frankie, Charlie has a long history of use for girls, as a nickname and a formal name. In the 1970s, Charlie was the name of a fragrance aimed at confident, independent women. “Kinda young, kinda now … Charlie! Kinda free, kinda wow … Charlie!” Then came Charlie’s Angels, the trio of crime-fighting women with cover model good looks – though the Charlie in the series was a never-seen narrator and voice on the speaker phone. Despite all this noise, the name didn’t chart in the girls’ Top 1000 until 2005, and is at a new peak of #229 as of 2014. Charlee, Charley, Charleigh, Charli – Here’s proof that this name has broad appeal. Charleigh and Charlee remind me of names like Kenleigh and Haylee, names that will appeal to parents after something creative and new. Sure, they’re just respelled forms – but that’s precisely why they’ll appeal to some parents. Carly, Carlee, Carlie, Karlee, Karlie – Most forms of Carly and company peaked in the 1990s, but they remain in use. Karlie actually climbed a few spaces in 2014. Carolina – Part-romantic place name, part-Spanish answer to Caroline. Carolina ranked #407 in 2014. Some rhyme the last part with concertina, with a long ee. The Southern states, of course, take a long ‘i’ sound, as in shine, mine, and James Taylor’s going to Carolina in my mind. The K spelling, Karolina, is also seen, though much less common in the US. Carlos, Carlo – Carlos is the Spanish form, ranked #117 in the US in 2014, and popular throughout the Spanish-speaking world. Carlo is the Italian, and might fit in well with ends-in-o names for boys like Leo and Arlo, though it does not currently rank in the US Top 1000. Giancarlo – Double-name Giancarlo – John-Charles – did chart at #823 in 2014. With Giovanni at #125, Giancarlo might not be so unusual. Carla, Karla – There’s something clunky about Carla. Maybe it’s Rhea Perlman’s smart-talking barmaid character from Cheers, or maybe it’s just not Carla’s moment. Carol, Carole, Karol, Carroll – Carol has history as a masculine name, and Carol and Karol are still used for men outside the English-speaking world. Carroll is a surname form, and Christmas carols make this feel like a seasonal name possibility with a musical side. None of them feel very stylish at the moment, but odds are that they’ll make a comeback eventually. Carlton, Charlton, Carleton – More surname forms, all with the very current -ton ending. Charleston – A Southern place name with serious potential for a boy – but one seldom heard. Carlota, Carlotta – I think of Carlotta as a name so clunky it could be cool. The ‘tt’ spelling is Italian. The single ‘t’ is Spanish and Portuguese. My understanding is that it is considered very frumpy amongst Spanish-speaking parents, but these things change! In the US, I think Carlotta could be surprisingly cool. Lottie – Lottie is a logical short form of Charlotte, and also fits in with Sadie and her sisters. Chase – Is it a form of Charles? 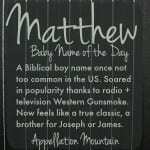 Not originally, but it is often considered a possible nickname in our era. Carina – One more that doesn’t really share roots with Charles, but could be considered related based on sounds. Contract Carolina, dropping the ‘ol’, and you’ll have dear Carina – a rarity with ties to the night sky as well as a fourth century saint. 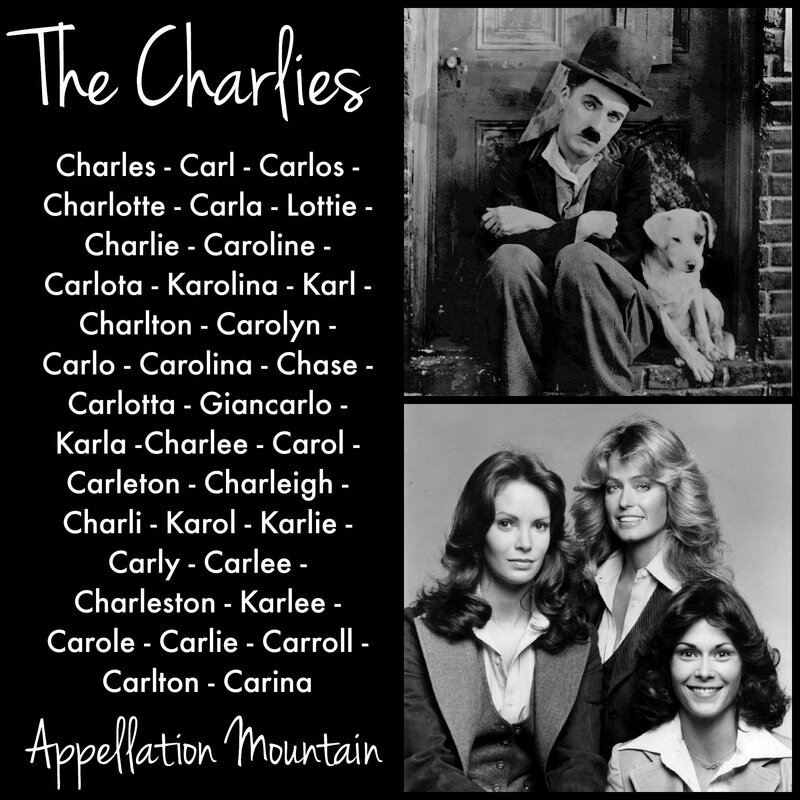 What’s your favorite kind of Charlie name? Charles and Cheryl are family names. 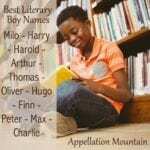 I’d consider using Charles nn Chase or Chip for a boy. 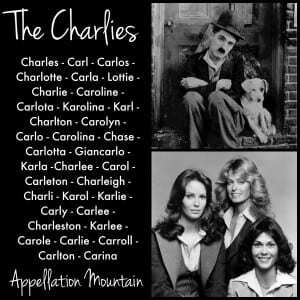 I used to love Charlotte, but I’d be more likely to use Carly now for a girl. I’d be surprised if Carol, Cheryl, or Charlene were revived during this trend. My daughter is Charlie Wilhemina, named for my father (Charles) and grandmother (Wilhemina/Billie). I love all the forms! My Swedish great-grandfather was christened Charles but alternated between Charlie and Carl after immigration, and named *two* of his sons Carl (Carl Edward and Carl Oscar). I love all the variations.